- One ventral D-Ring for attachment of descender. - Fully adjustable shoulder & thigh straps. - Application: Fall Arrest, Work Positioning & Rescue. Adaptability Adjustable shoulder, thigh-straps and waist belt; Sliding Plates for easy adjustment of Chest-Strap. Ergonomics Ideally positioned sit-strap for extended comfort. Attachment Elements – 2 Chest attachment D-Rings and a Dorsal attachment D-Ring for Fall Arrest. 2 Lateral D-Rings for Work Positioning. Adaptability – Adjustable shoulder, thigh-straps and waist belt; Sliding Plates for easy adjustment of Chest-Strap. Ergonomics -Ideally positioned sit-strap for extended comfort. Compliance – Conforms to EN 361:2002 and EN 358:1999. Made up of 12mm dia Polyamide Twisted Rope. The spliced end is protected with a strong transparent covering sleeve. This not only protects the splicing, but also makes the splicing visible for easy inspection prior to use. Thimble prevents the rope from being damaged by the metallic contact of the connector. The rope also has a coloured tracer strand which loses its colour in due course of time, to show that the Lanyard is now unfit for further use. · A full body harness “Class A” with permanently attached double 1.8M PP rope lanyard & scaffolding hooks. · Attachment Elements – A Dorsal Attachment D-Ring for Fall Arrest. · Adaptability – Adjustable chest-strap & thigh-straps. · With Chest D-Ring & 2 Mtr. Energy Absorbing Double Polypropylene Lanyard & Hook PN131 Permanently Attached. · A Dorsal Attachment D-Ring for Fall Arrest. 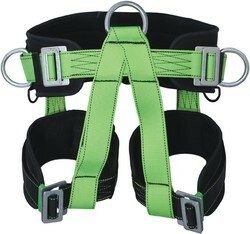 This Harness is used by mountaineers, tree-climbers and loggers, for positioning and rope access. 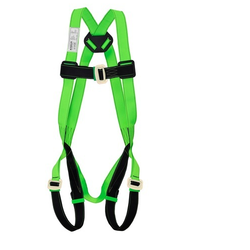 This Harness is equipped with light weight Aluminum D-Rings. Consists of two lateral D-rings for Work positioning and Ventral D-ring for Rope access. Adjustable Thigh Straps & Waist Belt. With wide and semi-rigid waist belt for excellent support. The waist belt and the leg straps are provided with a soft padding that provide best possible comfort to the wearer. The two lateral attachment points equally distributes the weight around the waist belt for comfort when leaning back. For comfort, the ventral attachment distributes the weight evenly between the waist belt and the leg loops during suspension work. Conforms to EN 358:1999 & EN 813:2008. 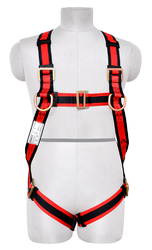 KARAM PN 51 (A) is a Sit Harness, and is not a Harness for fall protection. Looking for Full Body Harness ?